On a night where Eye of the Tiger Management’s burgeoning stable of prospects impressed with dramatic and explosive performances, three of the Montreal outfit’s crown jewels — Yves Ulysse Jr., Steven Butler, and Simon Kean — raised as many questions as they answered in their respective matches. 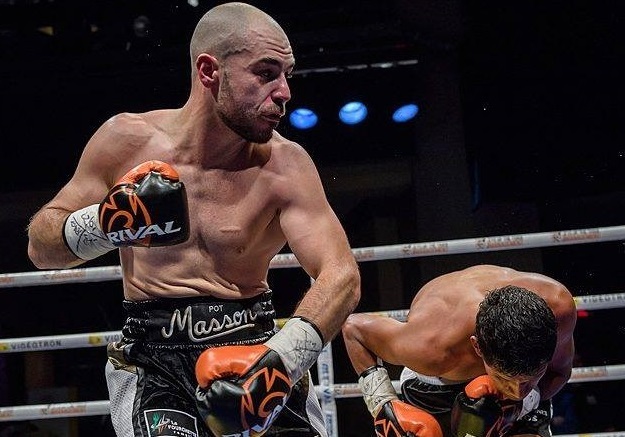 Ulysse, dynamic and skillful as ever, failed to completely separate himself from the tenacious Steve Claggett, winding up on the wrong end of a close and controversial decision. 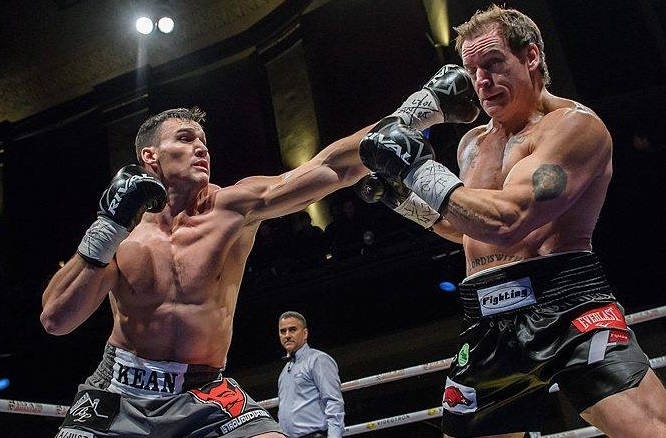 Kean survived a stunning flash knockdown to ultimately stop another overmatched foe. And an uninspired Butler plodded into the final round against veteran Silverio Ortiz before scoring a memorable stoppage. Ulysse vs Claggett was undoubtedly worthy of main event status and drew a sell-out crowd, reinforcing the argument that Montreal’s exceptional fight scene needs these kinds of high-stakes, domestic showdowns. Both men battled with skill and thrilled the crowd with dizzying punch outputs, their contrasting styles and tactics leading to a controversial split decision that went to the Albertan via scores of 97-93 (for Claggett, twice) and 96-94 (for Ulysse). 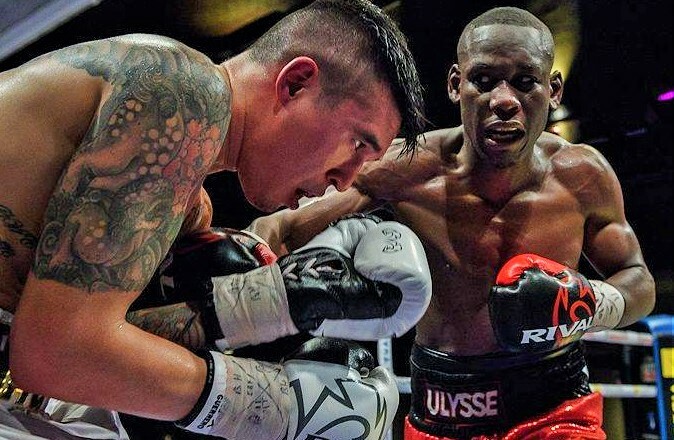 From ringside, Ulysse, now 14-1, appeared to have done enough to win thanks to his admirable handling of Claggett’s pressure and his landing the more eye-catching punches. It was a competitive duel, but for this observer, there’s no way Claggett won more than five rounds. We definitely need Ulysse vs Claggett II. The action was steady throughout, with Claggett (26-4-1) bursting out of the gates behind committed body punching and an admirable ability to cut off the ring and pin the slick Ulysse against the ropes. Ulysse, however, settled into a rhythm in rounds two and three, landing a slew of overhand rights and also digging the body. Despite being so slippery and athletic, Ulysse reminded fans of his toughness and ability to fight inside, and his manipulation of Claggett’s guard created openings for short but telling shots. Claggett, to his immense credit, never took a backward step, and he rebounded in the fourth to outwork Ulysse and even up the contest. Ulysse appeared to take command in rounds five and six by flipping the script and using subtle turns to spin off the ropes and fight off his front foot. Suddenly Ulysse was the bully and looked on the verge of widening a significant gap on the scorecards. But Claggett refused to wilt, and he out-muscled and out-fought Yves in the seventh until the Montrealer landed a booming counter right hand. Sensing that he needed an assertive finish, “The Dragon” practically sprinted out of his corner to start the eighth, creating a pattern that would define the final three rounds: Claggett outworking Yves early, only to see the house fighter close each round strong. It appeared that Ulysse took the last two rounds to secure a clearcut win, but the judges thought otherwise. All that said, Steve Claggett’s victory should not be viewed as a blatant robbery. He threw more punches than Ulysse, and was more consistent in tactics. One could argue that Claggett largely drew Ulysse into his kind of fight, while his steady pressure and thudding body blows evidently made a greater impression on the judges. For Ulysse, the questionable loss has to be bitterly disappointing, as it likely closes the door on a potential HBO slot on the Billy Joe Saunders vs David Lemieux card, but the bottom line is that, as well as he fought, he couldn’t outclass Claggett, which is something many expected. But as bitter a pill as the judges’ verdict must have been for the Montrealer, he was an admirable sportsman, raising Claggett’s arm to congratulate him while some of the city’s moronic fans showered the Albertan with verbal abuse. On the undercard, heavyweight prospect Simon Kean (11-0) left the fans in attendance wanting more, but he can’t exactly be blamed for it. Opponent Randy Johnson (13-3), a muscle-bound 39-year-old from Arkansas, appeared to hurt his knee after visiting the canvas from a left hook. Oddly enough, after Johnson rose to his feet and seemed to weigh his options about continuing, he caught Kean out of position with a counter shot and put him on the floor. That said, Kean was more embarrassed than hurt. Kean rose from a knockdown to get the win. “The Grizzly” stalked his hobbling foe to start round two, and the end came after Johnson sank under the weight of another burst of power punches only 34 seconds into the round. The ending, not to mention the fight in general, was anti-climactic, and one has to wonder what should come next for Kean. Is charismatic bruiser Adam Braidwood a step too far at this point? It’s difficult to say. Simon, at 28, is young for a heavyweight, so there’s no need to rush him, but what’s clear is that better calibre foes need to be found for future fights. Steven “Bang Bang” Butler (20-1-1), still very much on the comeback trail after his punishing knockout loss to Brandon Cook, salvaged a mixed performance by crushing cagey spoiler Silverio Ortiz (36-21) in the eighth and final round of a gruelling bout. In doing so, Butler becomes only the fifth man to halt the crafty Mexican in his 21 defeats. However, it was hardly smooth sailing; Butler struggled to cope with Ortiz’s in-fighting, and he kept circling into the path of looping overhand rights, flirting with the disaster that befell him back in January against Cook. Butler (right) ended his bout with authority. And yet, Butler is still only 22 and has prodigious natural gifts. While he wasn’t as explosive as in his impressive second round demolition of Damien Mielewczyk last June, the two right uppercuts that separated Ortiz from his senses in the final round — the first for a knockdown and the second literally freezing the Mexican in a sculpted posture of pure agony — were special shots. What’s clear, though, is that Butler needs more seasoning. 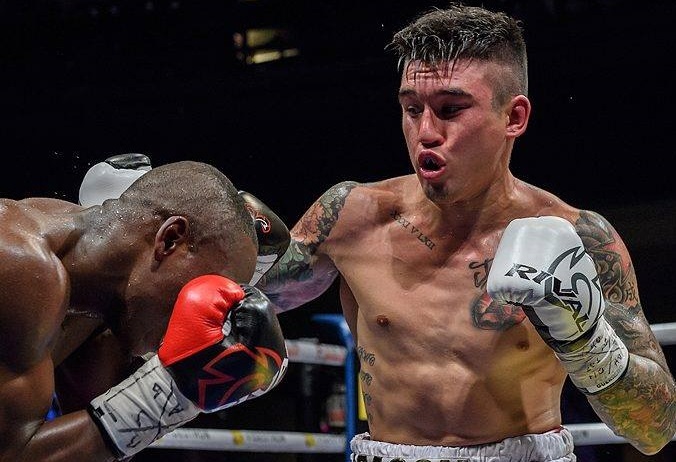 More training camps with elite fighters and another year of bouts at the Ortiz level would appear to be necessary to unlock Steven’s true potential. Why rush into a Cook rematch? Time is on Butler’s side, and he ought to be nurtured properly. 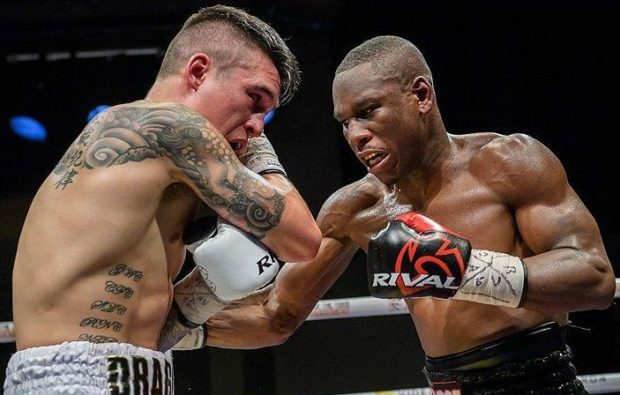 Compact welterweight wrecking ball Mathieu Germain (11-0) proved, once again, to be a dynamo with supreme conditioning as he battered Ricardo Lara (12-4) into submission. Lara was unable to answer the bell for round five after getting steadily broken down thanks to Germain’s pressure and varied combination punching. Although G-Time doesn’t have truly explosive power, his relentlessness and pressure will prove taxing for any opponent. 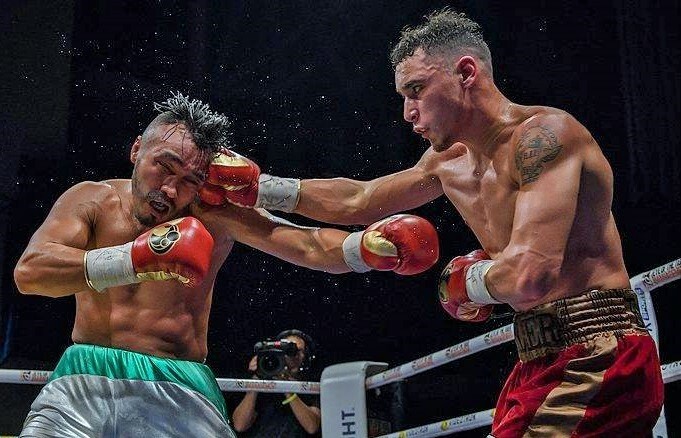 Batyr Jukembayev (10-0) further cemented his status as maybe the most impressive prospect in Montreal’s deep pipeline with a shocking and brutal first round knockout of rugged Mexican Jose Emilio Perea (24-9). 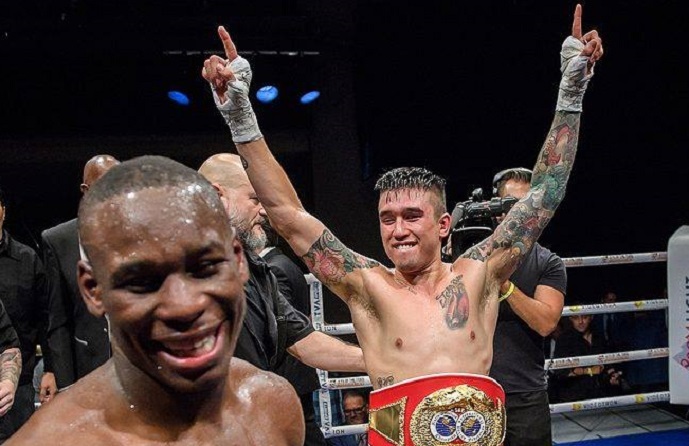 Consider that Perea most recently went eight rounds against Yves Ulysse Jr., extended Custio Clayton 10 frames before getting halted before the final bell, and actually upset David Theroux, and then weigh that against what the Kazakh destroyer accomplished. In scoring such a punishing knockout behind a blistering barrage of southpaw left crosses, Jukembayev made an emphatic statement indeed. Nurzat Sabirov (3-0), amidst the plethora of deep undercard fights, deserves to be singled out. 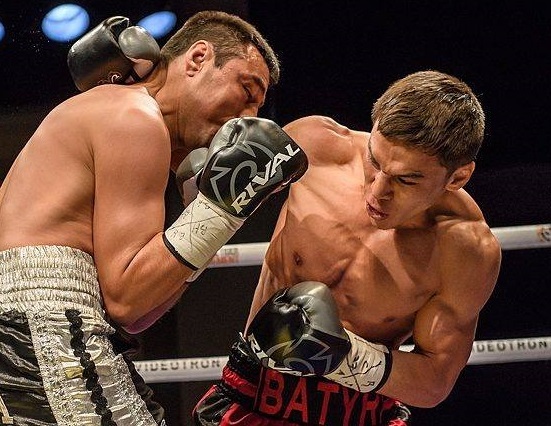 The Kazakh prospect, who scored a second-round knockout of Mario Baeza (8-5) fights with an irresistible panache. Although he’s certainly a novice pro and has much to learn, Sabirov’s punch fluidity is enviable, as is his ability to switch stances in the pocket. He also possesses killer instinct and the athleticism to throw a diverse array of punches from dizzying angles. Additionally, fan favourite David Theroux (13-2) boxed with some serious swagger to bludgeon the respectable Junjesie Ibgos (12-3) in three rounds. A volley of at least 40 unanswered blows left the Filipino reeling and gave Theroux the kind of dynamic win he was sorely in need of. 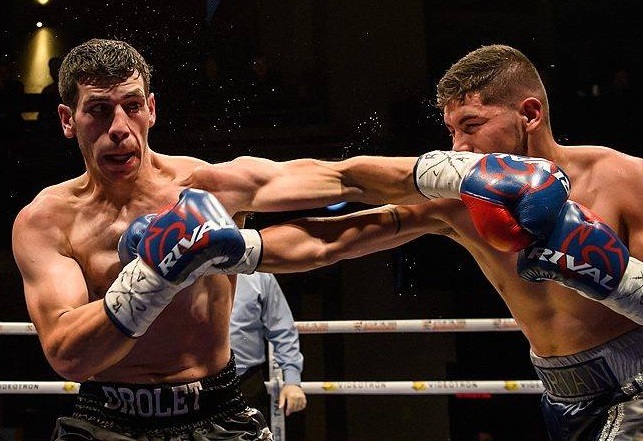 Other impressive results for Eye of the Tiger’s loaded stable included a methodical (in the best sense of the word) unanimous decision by Clovis Drolet (3-0), as well as a sickening first-round icing from Artur Ziyatdinov (2-0), who left Manuel Guzman (1-3) splayed on the canvas, the fighter’s right arm eerily, and stiffly, extended upward, as if grasping blindly for help. 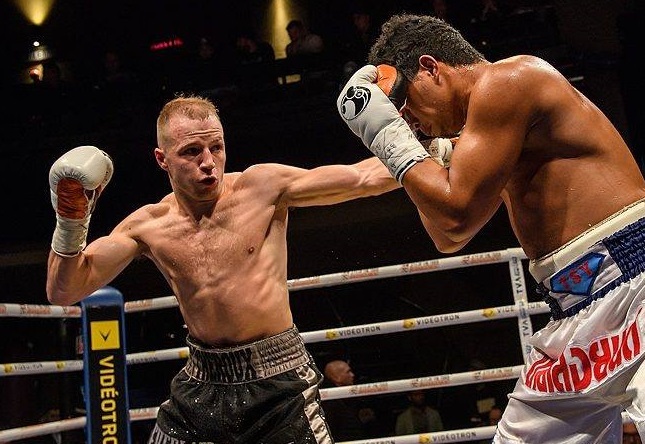 Also, switch-hitting featherweight Andranik Grigoryan (3-0) scored a unanimous decision over Giovani Martinez (6-5-1) in an entertaining scrap, and debuting Vincent Thibault, in front of his raucous cheering section, rose from two knockdowns to score a scintillating stoppage. So what were the major takeaways from this stacked night of boxing? 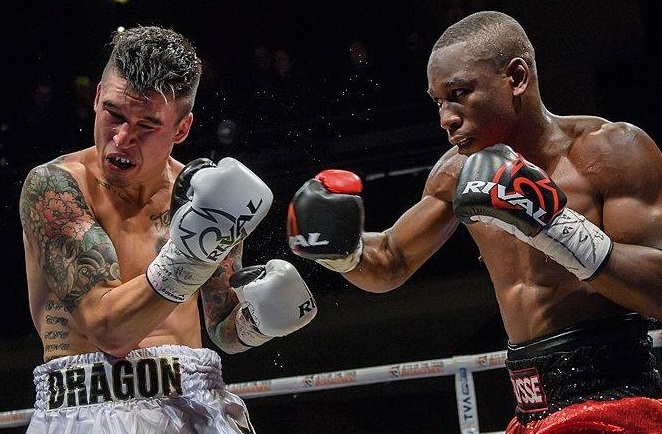 Yves Ulysse Jr. can still become a world-level contender, but so can Steve Claggett, and the fact that their fight was enthralling and competitive should be seen as a credit to both men instead of an indictment of Ulysse. The loss, controversy factored in, was an unfortunate lateral step for Ulysse, who will be 30 soon and needs to make his move now. Simon Kean and Steven Butler, while certainly at vastly different stages of their respective careers, need more experience and activity before attempting the move to elite status. Artur ZiyatdinovBatyr JukembayevClovis DroletDavid TherouxMathieu GermainNurzat Sabirovsimon keanSteve ClaggettSteven ButlerYves Ulysse Jr.